Gannon and Wyatt are working on a farm in Ireland, soaking in the rich Irish countryside, when they discover water pollution in the nearby river. It’s up to the twins to speak out, and bring the illegal pollution to the attention of the authorities. 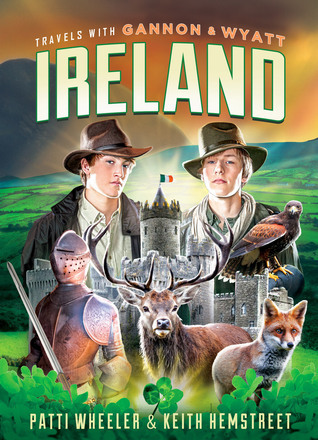 While they are gathering evidence, a dangerous suspect is determined to stop them, and the twins find themselves on the run in a mysterious Irish forest. Gannon is certain that fairies, elves, and maybe even leprechauns, are stalking them in the forest. But Wyatt, ever the scientist, is only focused on getting their evidence of the pollution safely away, so they can be used to convict the suspects. Another exciting book in the Gannon and Wyatt series! I am loving all these travel books! There is such a lush landscape, full of beautiful countryside and mysterious ancient magic. What better setting for an adventure story? Secondly, every book in the series does such a wonderful job of painting a picture of not only the country’s towns and forests and wildlife, but also showing the indomitable spirit of the people who live there. Ireland has such a rich cultural history, and that is honored and celebrated in this book!